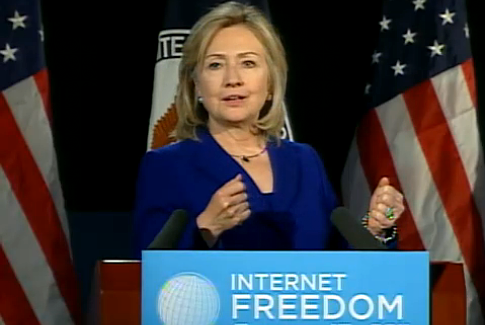 Secretary of State Hillary Clinton gave a speech today at George Washington University about Internet freedom, an updated version of the address she gave a year ago calling for more openness and an end to foreign governments repressing their citizens through the ‘Net. As it was then, Clinton’s speech was a heart-warming defence of the open Internet and the need for freedom of speech — with one notable exception: namely, WikiLeaks. While other governments need to be lectured by the U.S. on how to be more open and free, apparently it’s fine for the U.S. government to persecute a web-based publisher that is widely viewed as a journalistic entity, and is run by someone who isn’t even an American citizen. Egypt isn’t inspiring because people communicated using Twitter; it is inspiring because people came together and persisted in demanding a better future. Iran isn’t awful because the authorities used Facebook to shadow and capture members of the opposition; it is awful because it is a government that routinely violates the rights of its people. That said, however, the Secretary of State also went out of her way to defend the U.S. government’s approach to WikiLeaks, which has involved not only imprisoning the man who allegedly leaked thousands of diplomatic cables (former Army officer private Bradley Manning), but also going after WikiLeaks founder Julian Assange by any means available. The U.S. Department of Justice has been working on a legal case involving the Espionage Act, despite the fact that publishing classified documents is not actually a crime under U.S. law, Plus, if the DOJ is successful, the same charges would apply to the New York Times and other media outlets who have also published the cables. As part of its case, the government sent a court order to Twitter — and apparently to other web companies such as Google (s goog) and Facebook, although they have not admitted as much publicly — demanding that the company turn over a wide variety of personal information about Icelandic MP and early WikiLeaks supporter Birgitta Jonsdottir, hacker Jacob Appelbaum and a number of others involved with WikiLeaks. The government order covers not just IP addresses, and therefore locations, but also private messages, methods of payment and other materials. Jonsdottir and others named in the order are fighting these demands in a case that, ironically, was heard today. It’s been a false debate in many ways. Fundamentally, the Wikileaks incident began with an act of theft. Government documents were stolen, just the same as if they had been smuggled out in a briefcase. Some have suggested that this act was justified, because governments have a responsibility to conduct all of their work out in the open, in the full view of their citizens. I disagree. The Secretary of State argued that by publishing the cables, WikiLeaks exposed diplomats and activists “to even greater risk” — despite the fact that no one has made any credible claims that the cables published by either WikiLeaks or media outlets such as the New York Times have put anyone in danger. Clinton said in her speech that denouncing WikiLeaks “does not challenge our commitment to Internet freedom,” but on that point she is almost certainly wrong. And she seemed unfazed by the fact that her comments about targeting WikiLeaks came right after she censured foreign governments for attacking bloggers instead of upholding their rights to freedom of speech. It’s obvious that while the U.S. government is content to preach to foreign countries like China about how they need to open up, it’s more than happy to go after WikiLeaks using whatever means necessary — despite that what the organization did isn’t even a crime. That’s called trying to have your cake and eat it too, and it makes all of Secretary Clinton’s stirring talk about freedom difficult to take seriously. Demand Media — Search Spam or the Future of Content? Let’s remember, WikiLeaks (specifically US diplomats’ candid descriptions of their disgust with the behavior of its rulers) was the spark that led to the coup in Tunisia, which in turn prompted the revolution in Egypt. This is something neither US foreign policy nor the mainstream press could ever have achieved. Freedom comes from a free press, which is something Washington has perhaps not experienced in decades. The hypocrisy is obvious. Dude, you’re fantasizing. What possible connection does Wikileaks have to the citizen revolts that have been brewing in North Africa and the Middle East for a decade or more until they were catalyzed by social networks and the like? As hard as it may be to believe, citizens of other countries don’t live and die by the private conversations of American political figures; they have their own problems. So…did AOL secretly buy GigaOm too? How does this relate to the major themes in the masthead above? Don’t pretend that this is plausibly about Broadband – it’s link bait and/or Mathew’s excuse for a political rant. It’s annoying when the TechCrunch guys do it – it’s ridiculous here. So let me get this straight, Mathew: Your concept of “Internet Freedom” is an exemption from all national laws, legitimate and otherwise? That’s a very odd notion. Internet freedom doesn’t give me the right to break into your on-line bank account and steal all your money, and for that you should be happy. If the government’s actions against Wikileaks are unlawful, the courts will reverse them, sanction the government, and give Assange the key to the city of San Francisco. You don’t need to be so quick to hop on board the Berkman Center’s clueless train and get yourself worked up about all that. Secretary Clinton says the US is going to help foreigners exercise the same free speech rights they would have if they were in the US. That’s actually quite a huge step for most foreigners, and a reasonable thinker would be exploring the implications that it will have for the affected parties. I understand that there are those who insist that Internet freedom is mainly a question of free access to brand new movies, free downloads of the collected works of your favorite rapper, and the right to yell fire in crowded theaters. That’s not an adult response. But I appreciate the link you threw into the Berkman Center’s whine-a-thon. Only David Weinberger approached a reasonable reaction, but in the end even he fell into the “free downloads” trap. They give think tanks a bad name. Democracy has value in and of itself, and you don’t need free movies to validate it. You guys are so freakin hypocritical on this Wikileaks stuff. It just reeks. The documents were stolen, but if someone took your personal documents and put it on the web, you’d go absolutely nuts. I think organizations like wikileaks are necessary but you’re not trying to say that if I hacked your computer and posted your passwords on the internet wouldn’t be a crime are you? Hilarious Clinton is at it again. Will someone PLEASE put her out of her misery?